Check out ZURU’s new Attacking T-REX and Super-Fast, Super-Scary Spider robots! BEWARE: This dinosaur is really alive! 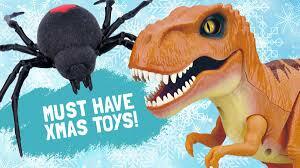 Utilising pioneering robotic technology, take on the brand new Attacking T-REX and Super-Fast, Super-Scary Spider! No ordinary pet, Robo Alive features robotic enhanced motion, realistic colouration and mouth movement, and comes in two different colours- russet orange or khaki. Creepy, crawly, and super scary! Zuru’s new Robo Alive Crawling Spider is the spookiest pet ever! Pick it up if you dare – then let it loose to frighten your friends with real, skin-crawling super-fast movement – and a furry spider body!